This Shorea Wooden Dining Set including 4 Shorea Dining Chairs and a 42" Table is the perfect set for any commercial outdoor patio venue. Each item of the set is made of Shorea wood that weathers beautifully, as it is a sister wood to teak, yet more economical. This classic design is well suited for hotel courtyards, malls, public gardens and dining patios, or anywhere outdoor seating is needed. 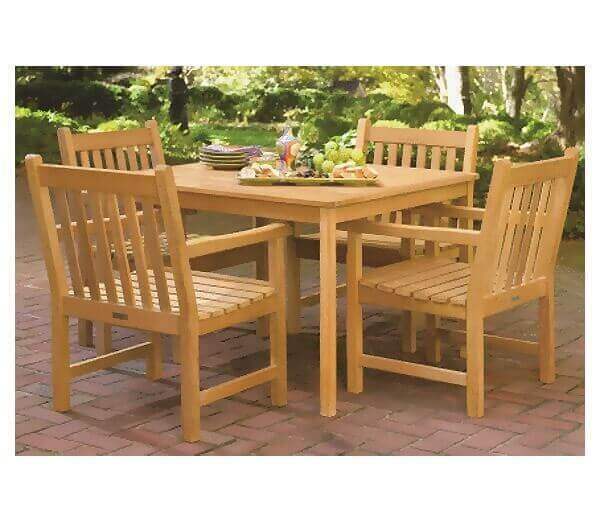 It is easy to assemble, low maintenance and offers the beauty of natural wood. 100% made in the USA and backed by a 1-year commercial warranty.